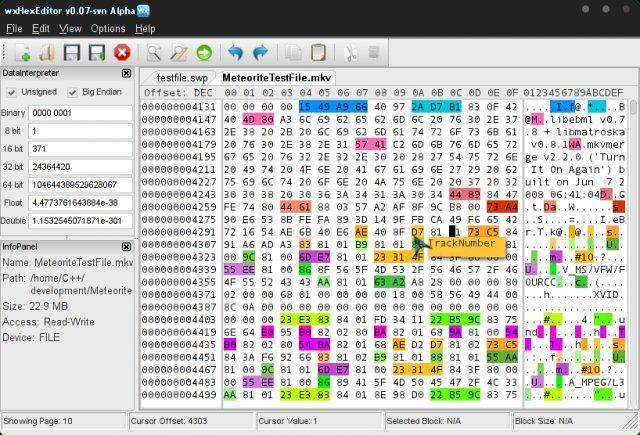 WxHexEditor is a very capable hex editor with a number of useful features. The program can open any size of file (the theoretical limit is 16 exabytes, or 16 billion gigabytes) just by dragging and dropping it onto the main viewing area. Various panes give you different views on your data: hex, text, a simple disassembler, basic file information and more. A tabbed interface means you can open more files as required, and easily switch between them. Whatever you've opened, wxHexEditor allows you to view its contents. You can search for text or hex values, manually edit bytes or run search and replace operations (files are by default set to Read-Only, reducing the chance of accidental alterations). And despite its lowly 0.22 version number, wxHexEditor has even more options hidden away in its menus. You can calculate 25+ checksums for any given file, for instance, or compare two files and highlight any differences. As a beta it needs to be used carefully, but wxHexEditor is already a very powerful tool, fast and packed with essential features.